This guide shows you where to unapprove or approve time/pay within an employee's timesheet. There may be an instance where within a timesheet, the employee's pay and the worked hours is to be approved separately, or a timesheet has been approved, but the pay or the hours need to be amended. 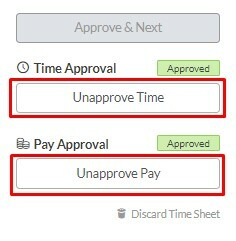 This can be done from within the Approving Timesheets section. Here, you can also approve time and pay separately. Simply navigate for the employee in the employee list and select the timesheet that needs amending. Then click 'Unapprove Time' or 'Unapprove Pay'. The below is an example of what happens when you click 'Unapprove Time', where you can see the details of the shift have now become editable. While the below shows us what happens when you click 'Unapprove Pay'. Here, you are able to amend an employee's pay details. Remember to APPROVE the timesheets after you have made the necessary amendments.